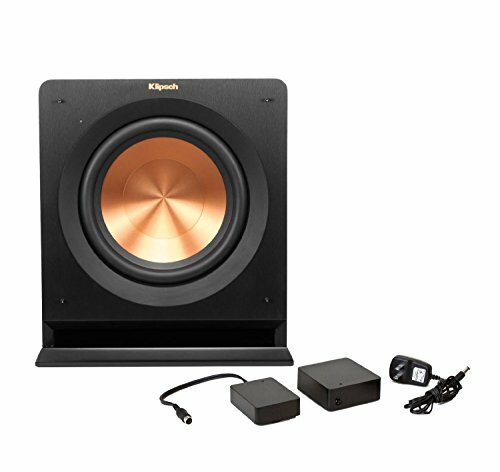 You get this great product.... Klipsch - R-110SW Subwoofer Plus, you get: Klipsch - WA2 Wireless Subwoofer Kit If speakers are the voice of an audio system, then the subwoofer is the heart. Klipsch subwoofers craft bass more powerfully or efficiently than their competition within similar pricing. From the 10" Spun Copper Front Firing Cermetallic Woofer cones, the brushed polymer veneer MDF cabinets and the 200 watt all digital amplifier are engineered to provide pulse-pounding low frequency response. Enjoy your music passionately played with the added depth and low frequency accurate response. Live the intense moments in your movies, and feel every explosion resounding right in your chest. Adding the WA-2 wireless adapter kit frees you to place the subwoofer anywhere in the room. Compact subwoofer with stylish finish Klipsch wraps the rigid MDF contruction with a durable black brushed polymer veneer that seamlessly blends with your existing system. Effortly match the R-110SW to any modern home theater décor. MDF Plinth An incredible acoustic decoupling technique that allows you to hear the subwoofer, not the room. Go Wireless The R-110SW supports the WA-2 Wireless subwoofer adapter kit and allows you to freely change its placement anywhere in the room. Tuck the subwoofer beside the sofa, place it in the back of the room or wherever it is the most convenient. Front LED Power Indicator Always no when your Klipsch R-110SW is powered on with the easy to read LED power indicator. Regardless whether on or off, the efficient subwoofer only uses a exceptionally low 1/2 watt or power in standby. Cerametallic spun copper drivers are incredibly lightweight in construction while maintaing their rigidity. The result is tight musical bass reproduction that adds depth to your favorite albums and movie soundtracks minimizing cone breakup and distortion. The integrated all digital amplifier supplies hard hitting powerful bass while maintaing efficiently reliable, highly accurate sound reproduction. Deliver all of the low frequency energy to the listening area with the slot loaded port below the main woofer. Focusing the physicality of bass energy and allowing greater installation and placement flexibility. Model: Klipsch R110SW/WA2 Bundle | 10"